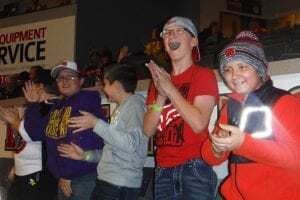 The second annual 4H Night for a Rapid City Rush Hockey game was held on Friday, Nov. 30. About 50 local 4H members and their families were among the almost 400 4H folks there, down last year’s over 1000 4H fans. The decline may be partially due to the predicted bad weather. The 4H kids and their families enjoyed music, activities, and the game! In addition, some of the 4H members had their names drawn to go down into the tunnels and greet the players as they went onto the ice.